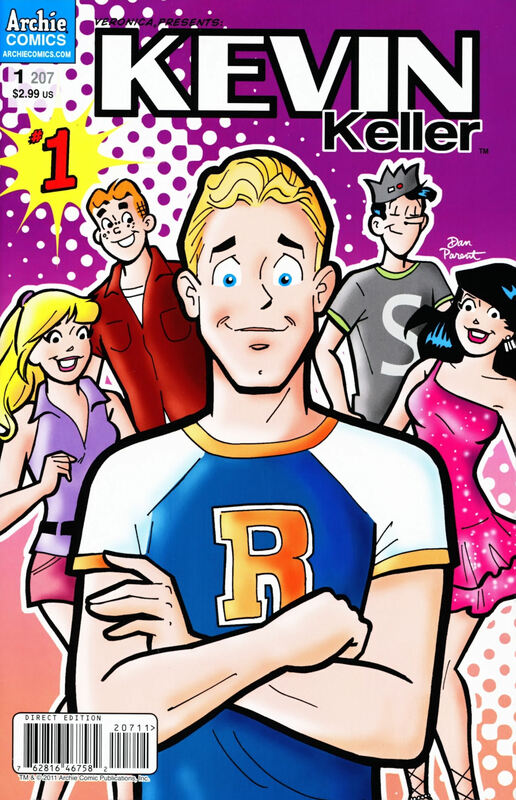 Branding four issues of the Veronica comic as a miniseries under a different name might seem like an odd thing to do, but it isn’t the first time Archie’s used an established title as a pilot springboard. Two years ago, Young Salem was tried out in the Sabrina comic. (Unfortunately, the title was cancelled just after that.) It’s a good way to force viewers to pay attention to your new character, since subscribers are automatically going to read the issues. 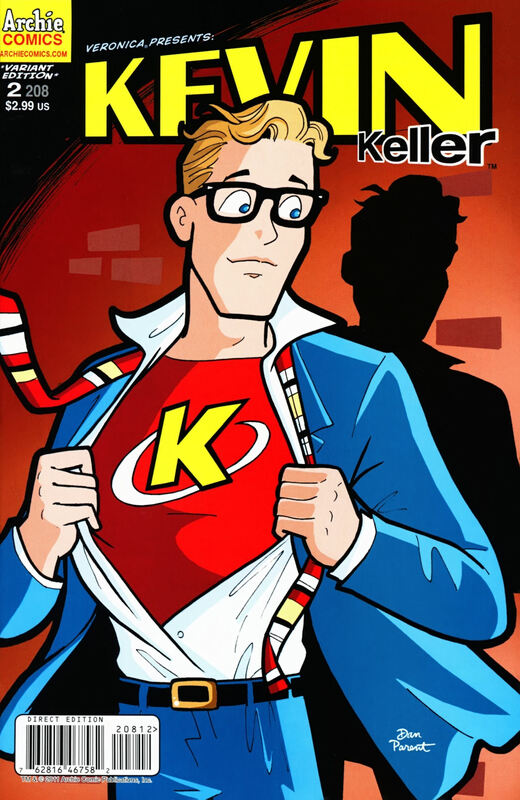 Thankfully, Kevin Keller (who first appeared in Veronica #202) is a great new character. Yes, he’s a little too perfect at times — he can go head-to-head with Jughead in an eating contest, and he has the fashion sense to match Veronica’s — but this focus story puts some meat in his history. His military background, with a father often absent on assignment and the resultant travel required of the family, is true to life, and it’s neat to see some of his previous friends, providing a natural way to find out more about his childhood. Frankly, I’m happy to see someone new shake up the established gang, especially now that the company has decided they’ve all been together since babyhood. The background stories are both silly and inspiring, as young, geeky Kevin protects his friends, not caring about his safety or happiness when it comes to preventing them from being hurt. The bullying he battles is surprisingly modern and subtle for an Archie comic, as a guy plans to humiliate his buddy Wendy when it comes to prom. We also get to see how Kevin came out to his friends and his family, and we find out he plans to join the military to follow in his father’s footsteps. That’s a very current plot twist, with the recent repeal of “Don’t Ask, Don’t Tell”, but one that also acknowledges the conservative patriotism and belief in family tradition held by part of the country. Artistically, the characters are always happy, no matter what’s happening, backed up by bright candy colors throughout. Events move quickly, with new information on almost every page. The new character of Kevin seems to have provided more energy to what can be a sometimes tired genre of teen comedy. This issue’s script and pencils are by Dan Parent with inks by Rich Koslowski. In the second issue, Veronica helps plan Kevin’s dad’s birthday party, an odd choice after she gave the guys food poisoning at the holiday picnic in the first issue. That’s a frame for Veronica rummaging through Kevin’s family photos and hearing more about how he grew up. The story is less comedic, more heartstring-tugging in this one, as Kevin explains how he dealt with his father’s absences, but that’s balanced by another tale of Kevin showing up bullies by out-achieving them in track. I was touched when Kevin helps out another boy who’s being picked on (not for being gay, just for being geeky) and tells him, “It gets better”, a good message for anyone struggling with adolescence. The one thing that’s missing so far is seeing Kevin get physical with a boyfriend or date. I’m not suggesting anything explicit, but there are a number of panels of Veronica hugging or hanging on him, so visually, the series isn’t yet giving the full message it should about Kevin’s preferences. But since there are still two issues to go, I’m sure it’s coming. The next issue, Veronica #209, is due out October 12, with the final issue of the Kevin Keller storyline following in December. A hardcover collection is due out in February 2012.